I took the train and three buses down from Washington State to Bodega Bay, CA. I left my seasonal home and job at Stevens Pass Mountain Resort for one a few thousand feet lower, with water a bit less frozen, quarters a little closer and skies a little less gray. I met the crew of the Hawaiian Chieftain, one of the two tall ships who sail up and down the West Coast year-round, owned by the Grays Harbor Seaport Authority, a non-profit educational organization based out of Aberdeen, WA, and they welcomed me aboard with open arms. I dove into learning appropriate knots, how to cast off and coil lines, tie and untie gaskets underway, climb aloft, keep watch, man the helm, check the boat and chart our course in transit. At each port, we take the inquiring public out on battle sails where we fire black powder at our nemesis ship, the Lady Washington (if you’ve been on one of our sails you may have heard – the Lazy Washingtub), we sail more chill evening sails – sails without black powder, but our primary focus, which the other sails help support, is our educational sails. During the education sails each deckhand or officer aboard is not only a sailor but an educator, helping teach students how to set sail, how to tie knots, as well as each of three classes – the daily life of a sailor, navigation, and the beginnings of trade in the Pacific Northwest. 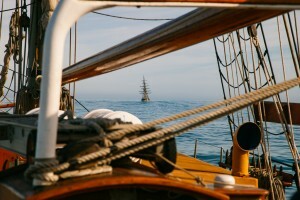 As much as I love firing our deck guns and making transit out in the ocean with the whales and bioluminesent plankton, or climbing aloft to cast gaskets while underway, I’d have to say seeing the bright-lit eyes on kids’ faces when they set the sails of an 18th century-based tall ship is the best. 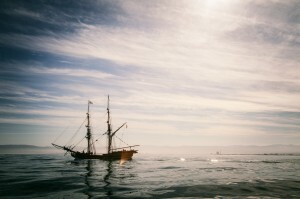 This entry was posted in California, North America, Oregon, Travel, U.S., Uncategorized, Washington and tagged education, Hawaiian chieftain, sailing, tallship by admin. Bookmark the permalink.